Alina Lundholm, granddaughter of Beany Lundholm, came to the village with other students from Augustana College for their January term to work and study. 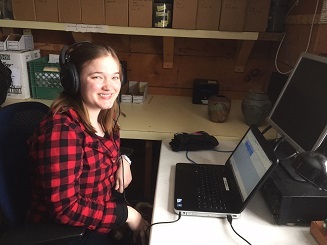 Alina joined the Audio Archive team for a few days and learned how to create mp3 files from cassette tapes and while there asked if we had any recordings of her grandfather. Carole Young who manages the Audio Archive Project immediately took Alina to our website and selected a recording of Musical Vespers featuring Beany and Alina's father, Mark. So on that day Alina heard not only her grandfather's voice for the first time, but her father's wonderful tenor voice when he was in his 20s. In the early days of the village, Beany and Phillip Brunelle adapted song favorites with village lyrics for after dinner sing-a-longs, fondly known as "Beany Sings".